Is Getting A Second Dog A Good Idea? Today I’m jumping into the time machine turning the clocks back to 2004 when I first picked up my rescue dog, Linus and also the first time I thought about getting a second dog. (affiliate link) and ever since then I always wanted two dogs: a brother (Old Dan) and a his little sister (Little Ann). However, after doing a ton of research and reading several books on raising and training puppies I decided that picking up two puppies at the same time was probably not the best idea. I guess I wouldn’t be living my childhood dream to be like little Billy Colman and his two Coonhounds. So how did I end up with two dogs? Keep reading to find out! Be careful! 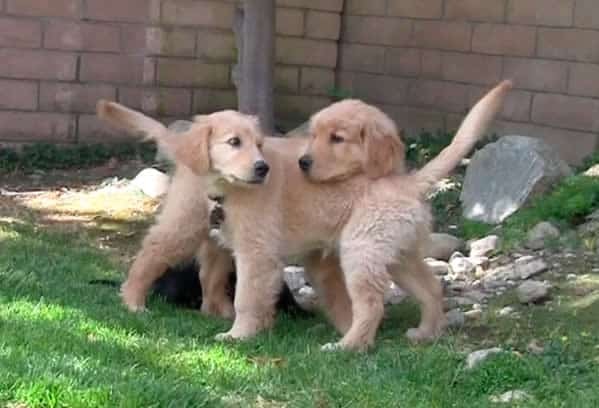 Your two adorable puppies could end up being a two-headed MONSTER! Before finding Linus at our local shelter I researched the many different dog breeds and studied everything from potty training to basic obedience to crate training. I was prepared to adopt my first puppy and during this time I learned that two puppies was not necessarily twice the fun. I can tell you now from experience that raising one puppy takes up almost all of your time and tests your patience to the limit. Now lets consider two puppies. Two pups require extra attention as they should be coddled and trained separately within your home otherwise you risk the two pups bonding to each other more than they bond with you. Now imagine trying to housetrain two puppies at the same time…can you say, “twice as many accidents in the house!” While Snoopy from Snoopy’s Dog Blog would be thrilled to hear all of the mischief surrounding two puppies I don’t think I could put up with more than one mischievous puppy at a time. As fate would have it when I went to our local animal shelter and found Linus low and behold he was lying right next to his sister. She was a beautiful tri-color Australian Shepherd mix. She looked much more like an Aussie than Linus who was all black. I was very tempted to bring them both home with me, but decided to stick with the experts advice and wait at least a year before getting a second dog. First take a gander at this wonderful video from Pets Add Life (PAL) showing why “Pets need a pal to talk to”. When Linus was about 2 years old I decided just like the video that he needed a pal to talk to and play with. I started by fostering puppies and dogs for one of our local dog rescues called Cuddly Canines. I was probably within inches of adopting one of our German Shepherd foster pups, but all 7 found homes fairly quickly and I was happy to see the smiles on each family that brought home a pup. In the end I started volunteering as a puppy raiser for Guide Dogs of America. After my first puppy in training, Stetson was career changed I ended up adopting him as my forever pet. It was a long journey to a household with two dogs. Our city only allows each household to have three total dogs and so I have not yet adopted another dog as I still volunteer as a guide dog puppy raiser and also as a foster. So even though I have only two dogs of my own I often have three dogs living at my house. What About Doggy Number Three? If you’re looking to add that second or third dog I highly recommend adopting from your local shelter or rescue. Across the country there are millions of homeless pets who need your help. From puppies to kittens to senior cats and dogs (and everywhere in between). Furry, scaly, big, or small all homeless pets deserve a second chance. Pets Add Life (PAL) put together a Facebook Pledge Page to help these homeless pets by asking people to take action now! Take a look, make a pledge, and please share with your friends and family. Here’s a link to the PAL Facebook Pledge Page. Does your dog or pet need a friend? Are you thinking about getting a second dog? How many pets do you have in your house? Tell us all about your pets in the comment section below. Disclosure: This post is sponsored by the Pets Add Life campaign and the American Pet Products Association. We are being compensated for helping spread the word about the benefits and joys of pet ownership. Thanks! I’m glad the article was helpful. It’s always a good idea to think things through before getting your first, second, third, or more dogs. I loved reading that book when I was younger! I have two dogs, both a year apart in age, both different breeds. We didn’t get the second until our golden was almost three, and it has worked out great for us. I loved that book too! I still kind of wish I picked up Linus and his sister that day at the animal shelter. I’m sure the first few nights would have been a little easier. I’m guessing not as much whining and crying. However, I’m pretty sure Linus would have bonded very closely with his sister and would have had separation anxiety from his sibling.